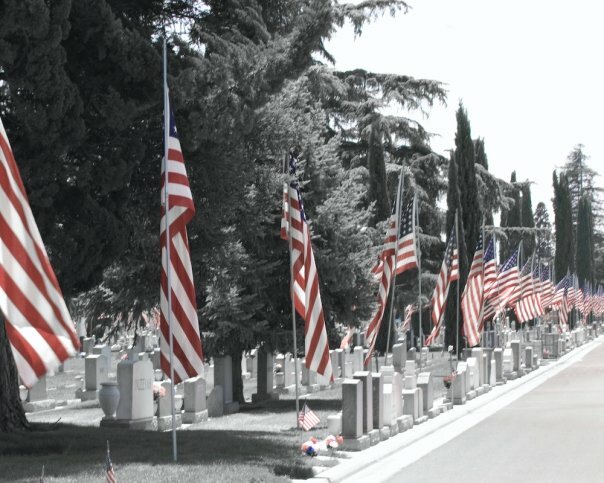 This is the cemetery in Turlock on Memorial Day. I came across this scene by accident. I was taking left-over flowers (from the Portuguese celebration) to the cemetery to lay on the graves of some of the deceased past presidents. It happened to be a Memorial Day and I was stunned to find all of the flags lining the driveway. It was (is) a beautiful sight and a touching tribute to our fallen heroes. The photograph does not do it justice, but I had to try. Memorial Day was very important to my mother. It is nearly a religious holiday in her small hometown in Idaho. Many people from the area travel back during the holiday weekend in a pilgrimage fashion to reconnect with families and friends and visit the local cemeteries. Many family members spend hours cleaning up and decorating graves for the occasion. Memorial Day means something to me today because of Mom. He birthday is the 24th of May and so it’s always kind of been “Mom’s Holiday.” Since her death in 2004, I’ve made sure her grave has fresh flowers every year to commemorate her devotion and respect for the holiday. It’s become a tradition that I know she’d appreciate.